RÉSONAANCES: What is Higgs telling us so far? Dear Jester, your comment about the better inverted sign of the Higgs coupling to fermion is funny. Just to be sure, is the axis the coupling itself, an amplitude of the vertex, or its square that normally shouldn't be negative? In the former case, haven't people made an unjustifiable assumption about the signs? Are the signs of the Yukawa couplings physical? Can they be reverted? Does it change physics? Is that an equivalence in the CKM matrix description? To summarize, haven't folks missed a possibility, a whole region of the parameter space? 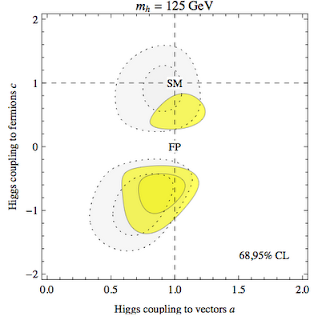 The y-axis is the Higgs coupling to fermions relative to the SM one. The sign of Yukawa by itself is non-physical, but the relative sign between Higgs couplings to gauge bosons and to fermions is physical. The tree-level processes don't care about the signs but there are loop processes sensitive to the relative sign, notably the Higgs decay to 2 photons. That's why the plots are not exactly symmetric wrt to the c=0 line. In the SM when talking about the signs one assumes that the fermion mass terms have been canonically normalized, which takes care of the phase ambiguity of the Yukawas. In that case one find the relative sign is always positive. Talking about glitches at this point is crazy. One should ask given the statistics what the probability is of seeing signals in all channels compatible within 1 sigma of the SM prediction. There's 16 channels! Being incredibly naive: the probability to find ONE signal within 1 sigma is 68%. Assuming statistical independence, I can raise that to the 16th power and I find 0.2% chance of all 16 channels being within 1 sigma. On the other hand, a signal will be within 3 sigma 99.73% of the time. Raising that to the 16th power gives 96%. So it would be somewhat worth our time to talk if we had a 3 sigma discrepancy. Right now, there's nothing non-SM about this! So, no, the "second thing to notice" is not glitches! It's "wow, I hope we get better statistics soon." Feel free to think about the best case / weird case scenarios, but don't claim signals right now. It's a boy who cried wolf type risk. 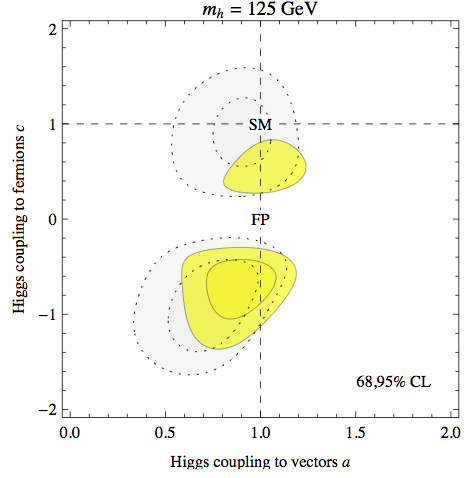 No one says there are any serious hints for BSM Higgs in the data, at least I didn't. 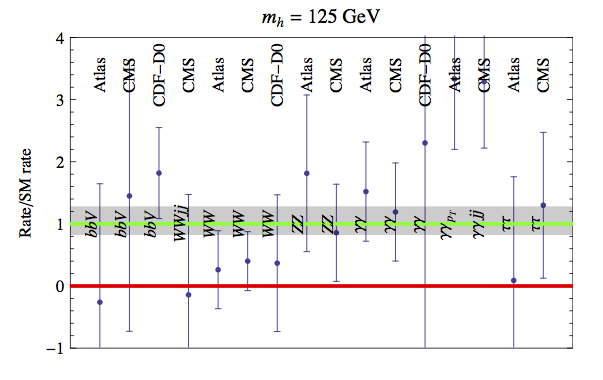 An experimental context reason for diphoton counts to be high in early data is that the diphoton data was the strongest indicator for determining that the other data fit the existence of a Higgs at all. 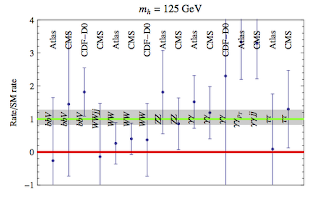 If your Higgs discovery trigger is a diphoton excess, you are much more likely to discover a Higg boson in runs with an excess of diphotons compared to random chance than you are during runs which have below average diphoton production rates. Hence, if any of the indicators would be expected to be unusually high at first, that would be it. If the excess trends down over the next few years after we know what to look for, then this was probably the cause. If it doesn't, then the error bars will get smaller and the Standard Model Higgs will need a tweak. As the exchange between Lubos and Jester illustrates, this is something of a "who ordered that" moment if the BSM physics here do hold up. The experimentalists may finally be getting an upper hand over the experimentalists for a little while. Very clear and probably right, Jester. Jester, Lubos, the relative sign that matters here is the one between the Yukawa coupling and the fermion mass. Fat fingers. Meant to say The experimentalists may finally be getting an upper hand over the theorists for a little while. In other words, theorists are having to respond to new data which don't fit into any theories, rather than waiting for experiments to be powerful enough to determine if the theories that they already have are correct. It seems that they depend a lot on the Tevatron "signal" in order to fix the tau and botton channels, do they?